Is gold, is good, is not just mis-quoted from the Dons brand of meats (Is Don, is good) but is also the theme of the Deutschebank who calls gold "goodmoney" and paper "bad money". Now is a good time to buy gold it. To substantiate that, it has been reported by Reuters that Hong Kong's net gold flow to mainland China has jumped 47 percent in 2012 to a record high of 557.478 tonnes, showing the continued determination by China to be the world’s largest holder of gold bullion. In December, Hong Kong shipped 114.372 tonnes of gold to China another record high for monthly exports and according to the Hong Kong Census and Statistics Dept, the total gold shipments to China last year jumped 94 percent from the 2011 total to over 832 tonnes while imports were six times higher at 274.684 tonnes. "It is not a surprise," said Dan Smith, head of metals research at Standard Chartered. "Consumer and investment appetite was quite strong and no one knows how much the central bank is buying." "This is a very strong number," said Nick Trevethan, senior commodity strategist at ANZ in Singapore. "China's implied gold demand looks set to approach or exceed 1,000 tonnes based on Hong Kong trade data and the annualised gold production number. The implied demand could reach 1,050 tonnes if gold inflow from other channels is factored in.” he said. 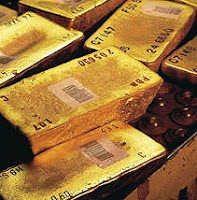 China produced 322.8 tonnes of gold in the first 10 months of 2012, up 11 percent from a year earlier, said the Ministry of Industry and Information Technology recently. Physical buying at the start of 2013 was strong as seasonal demand picked up before the Lunar New Year, which falls on Feb. 10. But buying has since ebbed as prices moved higher and settled in a range bound mode. Meanwhile, back at the ranch, the Virginia House of Delegates Rules Committee recently passed a bill to establish “a joint subcommittee to study the feasibility of a United States monetary unit based on a metallic standard, in keeping with the constitutional precepts and our nation’s founding principles….” This legislation authorizing the study widely is expected to sail through the House of Delegates and may well be embraced by the Virginia Senate with a signature by the governor. The financial and political media have also taken to calling the gold standard “mainstream.” The London FT for example, published on August 23, 2012, “The gold standard has returned to mainstream U.S. politics for the first time in 30 years….”;. The New York Sun editor Seth Lipsky in The Wall Street Journal , ‘The Gold Standard Goes Mainstream.’ And in the New York Times, ‘A Gold Standard is Unthinkable No More’. The wheels are slowly turning in favor of a gold standard or at least a return to gold as an important stored value for banks. This might explain why gold has been quietly elevated to a tier one of the capital adequacy ratio http://buying-gold.goldprice.org/2012/06/gold-capital-adequacy-ratios.html and why banks are so keen to bolster their gold holdings. Such an action places a higher value on gold as it is now deemed with a 100 percent weighing instead of the former 50 percent. It seems that ‘is gold is good’ is becoming a popular theme for 2013. This interest by the heavy players looks like the beginning of a new gold rally and could signal a steady rise in the gold price. Perhaps how the time to buy gold before the rally begins. Why is the gold price down?